Summon: Give a creature in your hand Guard. 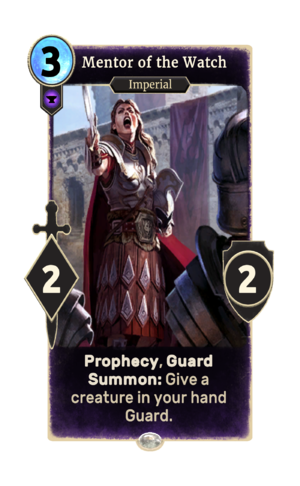 Mentor of the Watch is a common Endurance creature card. It is part of the Heroes of Skyrim expansion. "Time to take the offensive." This card's summon ability applies the Watch Duty card effect. This page was last modified on 27 February 2019, at 19:17.